A biography of Otis Redding, The King of Soul, timed to coincide with the 50th anniversary of Redding's iconic performance at the 1967 Monterey Pop Festival. The book will appeal to those interested not just in the nuts-and-bolts of where Redding’s talent was birthed but how soul music developed over the course of the 1950s and 1960s. Rich with meticulously recounted contextual details along with critical insights, Gould’s book balances the historical with the musical to trace the evolution of a great American talent ... Gould connects a lot of dots among the details of life in the segregated South, Redding’s family history and the ways pop music was changing in the mid-20th century ... With meticulous scholarship, lively prose, and a tale that uses a singular musician as a springboard into interrogating America’s political and popular cultures, Gould has created a vital book that helps contextualize one of the most important figures in pop music. Mr. Gould takes a scholarly, wide-angle approach similar to the one he took in his 2007 cultural study of the Beatles, Can’t Buy Me Love. He has tapped into new archival sources, including unpublished interviews with key figures like Wexler, and he has the cooperation of the fiercely protective Redding family. Otis Redding is an incisive and deeply humanistic portrait, if at times offering too much of the big picture and not enough of the Big O.
Jonathan Gould has written an absorbing and ambitious book about a life cut short, a life devoid of the melodrama and self-destruction that enliven the biographies of so many of Otis Redding’s contemporaries … Gould’s book doesn’t challenge the consensus that Otis Redding was a remarkable and remarkably decent person. In fact it succeeds in making him seem a good deal more remarkable by taking the measure of the historical circumstances he emerged from. The known day-to-day facts of Otis’s short life are only part of the narrative Gould has framed … Gould situates these microworlds within a much wider field of action. To do so he often leaves Otis aside for pages at a time, a maneuver he executes with great confidence. None of these excursions are digressions or footnotes; every detail feeds back into the story he is telling. 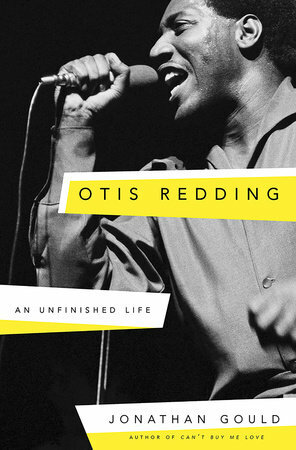 What did you think of Otis Redding: An Unfinished Life?